"Sampath Speaking" - the thoughts of an Insurer from Thiruvallikkeni: how tasty is the food cooked by robots !! How often do you take hotel food ? ~ what is your primary aspect of selecting a hotel – the taste, the quality, the price, the ambience or .. .. .. !! ~ at Triplicane, there are no. of messes (Bharati Mess is a famous one at that) as also hotels like Ratna café besides road side eateries – there are crowds everywhere !! there is also the aspect of service – the servers, their looks, the way they treat people and the way food is served .. .. many of that will have no meaning when you order food online – through Apps – Swiggy – Zomato – Ubereats .. ~ one gets to see so many of such delivery vehicles swirling on road these days !! Here is a restaurant miles away in Boston which claims to put a lot of thought into what makes a good meal. Interestingly, their web reads : everything has to taste great, so our recipes are inspired by the most delicious spices, flavors and textures from around the world. 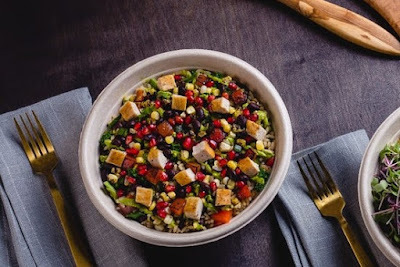 It’s also nice to have choices, so each one of our bowls can be customized to your taste and we have vegetarian, pescatarian, gluten-free and vegan options. Finally, we know the importance of presentation, and our Garde Manger (pronounced gar-mahn-jey) will apply the finishing touches. We want our food to look as good as it tastes. Now open for business in downtown Boston, Spyce offers a half dozen bowls of food in Latin, Mediterranean, and Asian styles. Prices start out at just $7.50 a bowl. The explanation for the budget conscious price tag is because using robots to prepare the meals saves on costs. These savings are then passed directly on to the customer for an experience that’s both high-tech and wallet-friendly. If you have not noticed, there is conspicuous mention of ‘robots’ .. yes – robots – making your food. It further adds that when customers enter Spyce, they are met with a human guide who shows them to a touchscreen kiosk where they can place their order. This order is then sent to the kitchen — which is visible to the customers — where the food is prepared by robots. Finally, it’s handed over to a human employee to add garnishes like cilantro or crumbled goat cheese, before being distributed to the customer. If some is worried about a lack of human chef expertise, though. The Spyce robots precisely execute recipes created by Sam Benson of the celebrated Café Boulud. The company also boasts Michelin-starred chef Daniel Boulud on its advisory board, having agreed to participate after seeing a demonstration of the robot in action. Started by a group of 20-something robotics engineers from Massachusetts Institute of Technology who partnered with Michelin-starred chef Daniel Boulud, the new restaurant in downtown Boston is founded on the idea that a fulfilling meal can be more science than spontaneity. 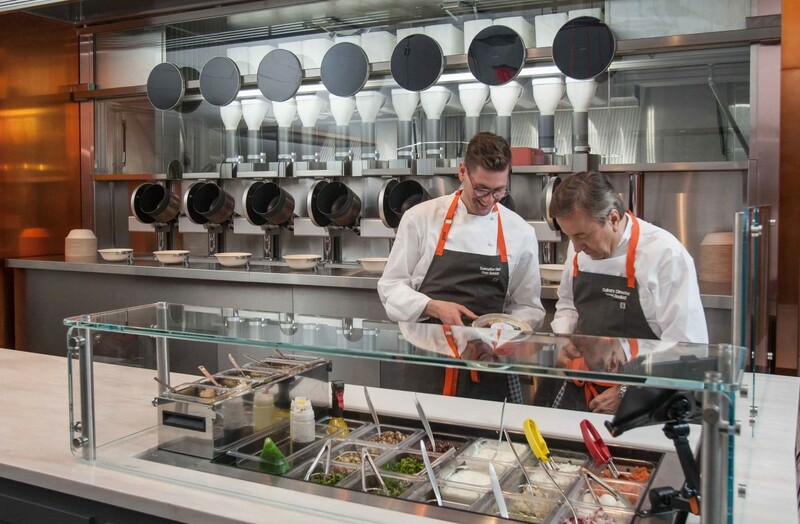 The restaurant’s founders have replaced human chefs with seven automated cooking pots that simultaneously whip up meals in three minutes or less. “The ingredients are portioned into the correct sizes and then delivered to a robotic wok, where they are tumbled at 450 degrees Fahrenheit. The ingredients are cooked and seared. And once the process is complete, the woks tilt downward and put food into a bowl. And then they’re ready to be garnished and served. So, that in Boston, is Spyce, the world’s first restaurant featuring a robotic kitchen that cooks complex meals. Back home, Robot, previously known as MOMO, is a restaurant in Chennai's Old Mahabalipuram Road (OMR – IT corridor), serving delicious Thai and Chinese food. This is the first robot-themed restaurant in India. Here the food is cooked by humans but restaurant has four robot waiters or servers, who bring food to the customers' tables. The restaurant, was founded by Venkatesh Rajendran and Karthik Kannan.